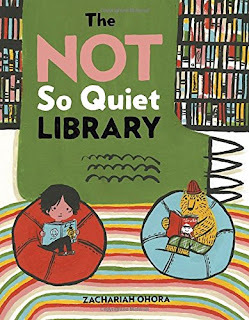 "It’s Saturday, which means Oskar and Theodore get to go to the library with their dad! It means donuts for breakfast! And it means endless quiet hours lost in stories. But on this not so quiet Saturday, Oskar and Teddy get a rude surprise when they're interrupted by a five-headed, hangry monster! Will Oskar ever get to finish his book in peace? Will Teddy ever get to gorge on his donuts? Or might both of them hold the secret weapons to taming the beast?" I've enjoyed OHora's work in the past, and perhaps my high expectations are what led me to think this one was a bit of a flop. The story of a five-headed "hangry" monster in the library just didn't jive with me. That's not to say kids won't love it; Oskar and Teddy end up being the heroes after some quick thinking and ingenuity, and kids will really identify with that. 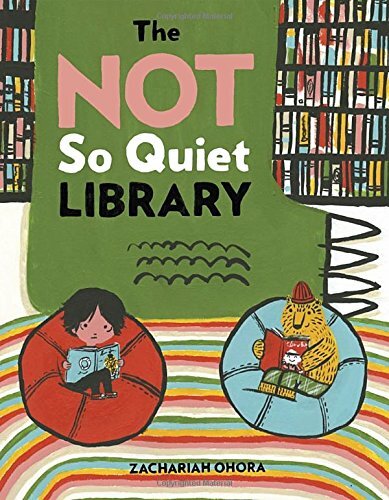 And, I must say, I do appreciate that Oskar and Teddy defended the books--definitely a lesson I can appreciate being taught to young readers. The illustrations are still fantastic, with OHora's signature bold and bright style. There's lots of little details to appreciate and bits of humor to keep things light (though do be aware that the monster may still be pretty terrifying for the youngest of readers--I mean, it is five-headed and trying to eat people). In the end, the story is just not my favorite. If you try it out, make sure to have a donut or two on hand to satisfy the craving you'll have after reading. "Yap, yap, yap! Pug sees Peg through the window. He wants to join her! Why won't anyone take him on a wonderful snowy walk? Mom is just too comfortable in her recliner. Dad is tired from shoveling. That leaves lazy Tad, who is still sleeping. Yap, yap, yap! insists a determined and clever Pug." Ethan Long is a genius when it comes to easy readers (and I'm not just saying that because he's won awards). 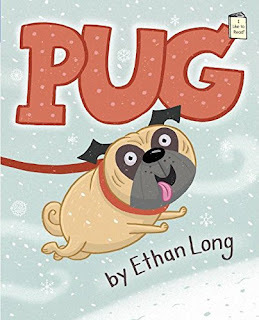 Basically, he makes this book totally accessible to the very earliest of beginning readers, with just a few words on each page ("Pug see Peg" and "Pug wants to go"), and yet, tells a completely engaging story. The illustrations are, of course, a big factor, helping readers to infer more of what's going on than what three words can convey. And while a dog wanting to go for a walk may not be the most exciting of stories, I would still recommend this book. 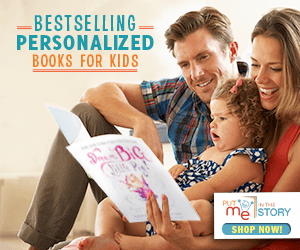 It's perfect for the newly independent reader. 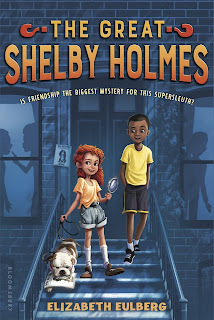 "Shelby Holmes is not your average sixth grader. She's nine years old, barely four feet tall, and the best detective her Harlem neighborhood has ever seen--always using logic and a bit of pluck (which yes, some might call “bossiness”) to solve the toughest crimes. 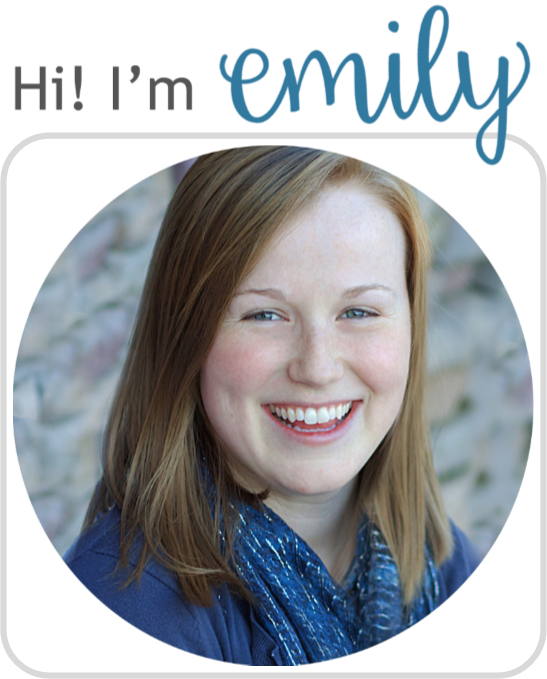 When eleven-year-old John Watson moves downstairs, Shelby finds something that's eluded her up till now: a friend. The easy-going John isn't sure of what to make of Shelby, but he soon finds himself her most-trusted (read: only) partner in a dog-napping case that'll take both their talents to crack." Sherlock Holmes adaptations are plentiful, and this one was not altogether that revolutionary. If you've got a mystery fan, particularly a Holmes fan, then it will be easy to appreciate this story. Eulberg is especially good at including nods to the original story (e.g. Shelby's dog, Sir Arthur). However, for me, the case itself dragged a bit, with no major developments or plot points to drive excitement. It became a bit tedious, especially with Watson ready to point the finger at whoever walked in front of him. It was not the most exciting of cases to solve. The characters themselves were pretty good. John Watson had some appreciable diversity, being black, an Army brat, and diabetic. Then Shelby herself, of course, was a very good Sherlock--but some of her vocabulary (being the smarty at she is, after all) had me double checking the dictionary! it might be a bit tough for the target audience. I'm worried that between some of the drag and tough vocabulary, some kids may not be willing to see it through. In the end, it's a good one to add to the list for mystery fans, but I'm not in a rush to recommend it to just anyone.